I hope you all had a beautiful Christmas. Ours was relaxed, yet full. We enjoyed days filled with love, family and just good times all around. As the end of the year draws near, it is natural to spend a moment in reflection. 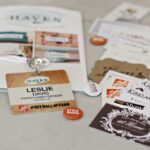 This year, the blog has experienced fantastic growth and I am grateful for all the new readers and followers who have continued to cheer on our DIY and creative efforts. Funny thing is, I would likely tackle most of the projects regardless of the blog, but getting to share and hopefully inspire you, is just the best job I’ve ever had. Thank you! So, let’s start this look back at 2015 with a couple favorites. 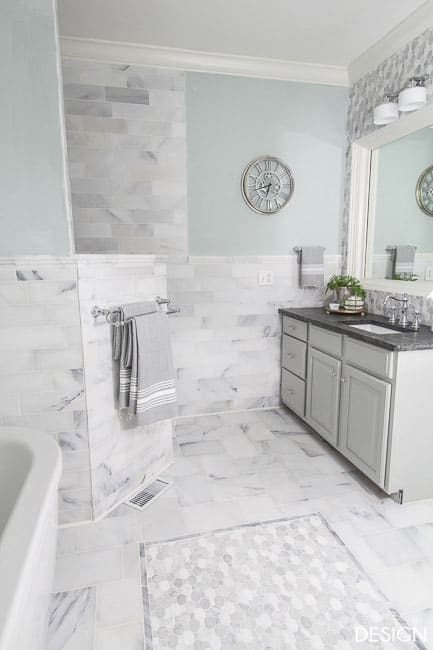 Favorite: Marble Master Bathroom. While this project, completed right before Thanksgiving, is still too new to truly be considered one of the most popular, it is swiftly becoming a favorite. It’s definitely my favorite. I still have to pinch myself when I step into this room. Because it was completed near Christmas, the tutorials were set aside for Christmas related editorial content. You can look forward to many tutorials and how-to’s related to this renovation. But you can see the big reveal of this remodel and all the details here. Favorite: Modern Vintage Teenage Bedroom. I added this project to my favorites list because it was probably the most fun! 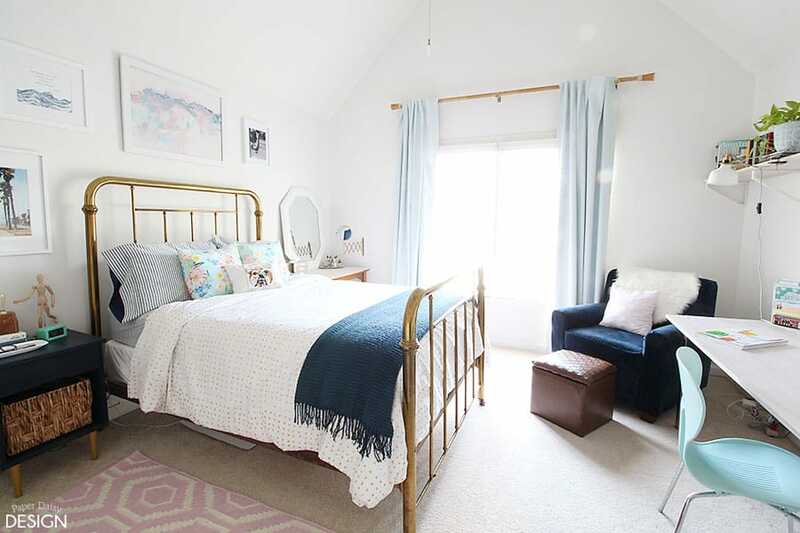 I collaborated with our daughter to re-design her bedroom. We really enjoy the process of bouncing ideas off of each other. The room is full of inexpensive, DIY goodness and vintage finds. The room reveal has the complete details. Favorite: One Kitchen, 3 Ways. 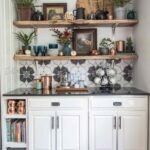 We completed our kitchen remodel some time back but I had never posted an official “reveal” so I went out on a limb and styled our white kitchen 3 ways as an expanded reveal series. A summary of the kitchen styles are in this post along with what our kitchen actually looks like day to day. 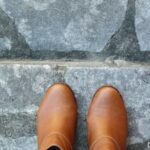 Now for the 5 most popular posts from this year. Well, actually it’s six because there was a tie! 5. 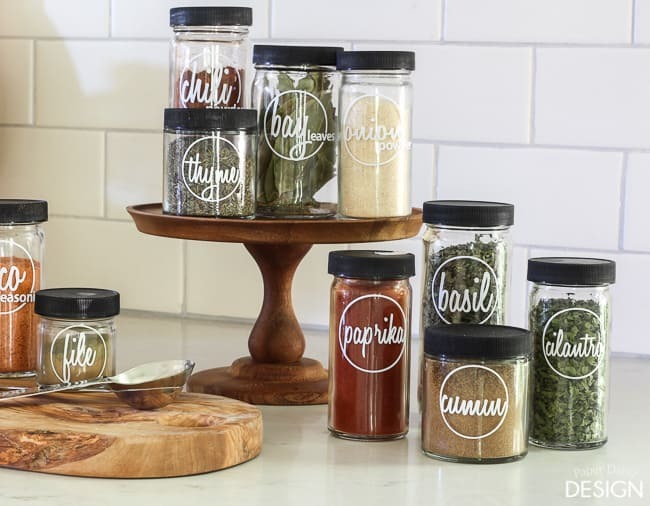 Open Spice Jar Labels. After I built a spice rack in once was wasted space in the kitchen, I decided to design spice jar labels worthy of their prominent location. 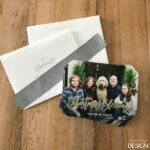 While this is a free cut-file, there are a few important tricks to this complex design, but it is definitely an easy project. You can see that post and download the cut files here. 5. 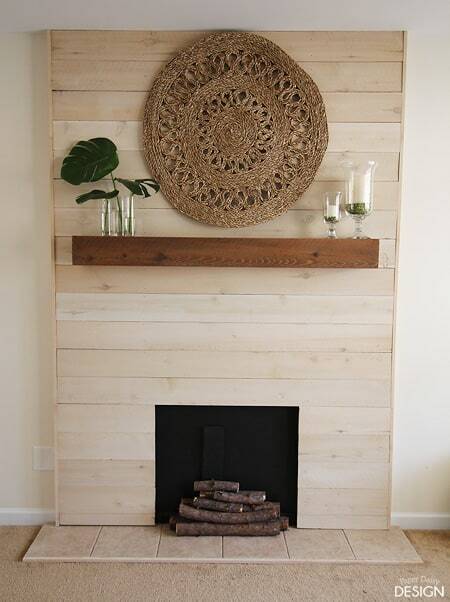 Faux Shiplap Fireplace. This post had exactly the same number of page views as the Spice Jars and I’m so glad I realized there was a tie, because this project is very special indeed. It’s an inexpensive, easy DIY, but for one deserving family it transformed their living room into a cozy space with a much needed focal point. You can read the whole story and the tutorial here. 4. 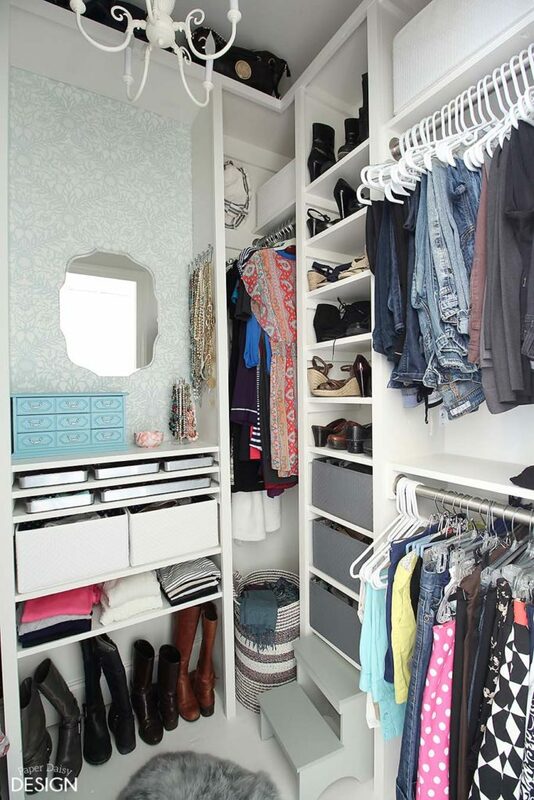 Dressing Room Closet Makeover. Transforming this tiny closet into a dressing room is a luxury I never thought possible, but with the sliding barn doors we built (see 1 &2) it indeed became a reality. This post and project is proof that even small spaces can be functional and beautiful. More photos and building plans here. 3. Tiny Laundry Room, Tiny Budget. 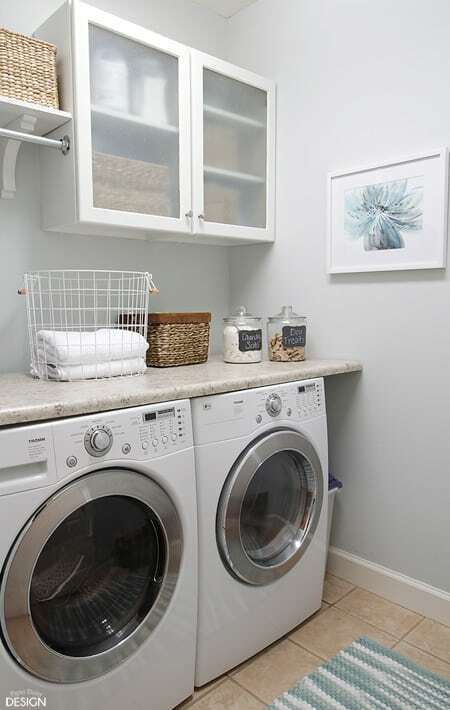 Also a small space, our laundry room got a cosmetic update with a few inexpensive additions. Funny how a few minor changes transformed this tiny room a space I don’t mind spending time in. I bet there is an idea you can use in you laundry room too. Of course I can’t promise that you will actually enjoy doing laundry. But you probably should check out the many helpful ideas packed into this post. 2. Modern Barn Doors for Awkard Entries. 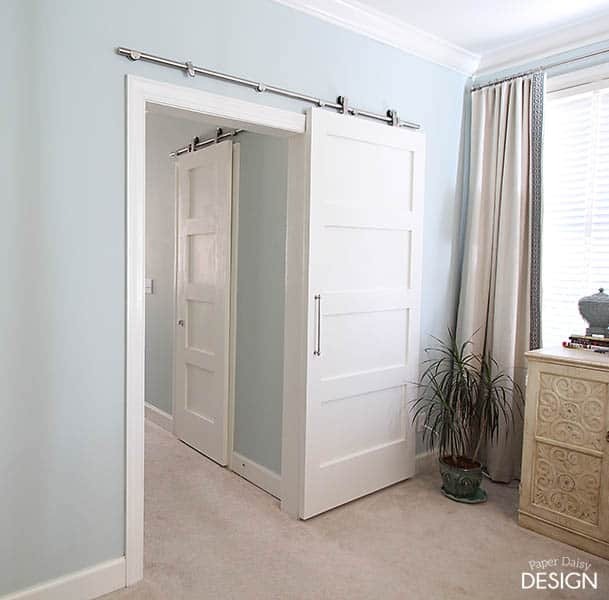 It is no exaggeration when I say these doors totally transformed our master suite. And based on the popularity of these posts, many people are looking for stylish solutions for traditional, often awkward entry doors. Aesthetically, most barn doors are for more rustic spaces , but the simple lines of our doors and hardware can blend harmoniously in many interiors. I share complete sources and how-to’s in this post. 1. Build It: 4 Panel Barn Doors for under $50. The title of this post says it all. Complete building plans and instructions for building your own custom sized solid wood doors can be found here. Again, I thank you for reading and I hope you continue to follow me in my adventures. I’ve got some big projects planned this year and you won’t want to miss what’s in the works for January! I’ve add some social media links here for your convenience so you don’t miss out. « Wishing you a very Merry Christmas! Now I need to check the bathroom, it’s beautiful! Christina, Thank you for your comment. The barn door is not only one of my favorite projects of all time, I can’t begin to tell you how much they changed the room! Definitely big impact with a small project.